Dr. Carol Rosin was the first woman corporate manager of Fairchild Industries and was spokesperson for Wernher Von Braun in the last years of his life. 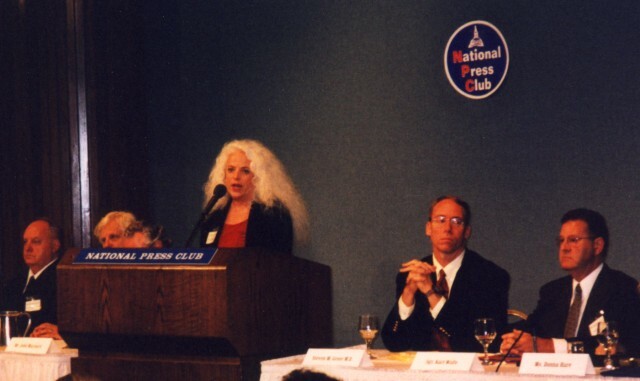 She founded the Institute for Security and Cooperation in Outer Space in Washington DC and has testified before Congress on many occasions about space based weapons. Von Braun revealed to Dr. Rosin a plan to justify weapons in spaced based on hoaxing an extraterrestrial threat. She was also present at meetings in the ‘70s when the scenario for the Gulf War of the ‘90s was planned. CR: My name is Carol Rosin. I am an educator who became the first woman corporate manager of an Aerospace Company, Fairchild Industries. I am a Space and Missile Defense Consultant and have consulted to a number of companies, organizations, and government departments, even the intelligence community. I was a consultant to TRW working on the MX missile, so I was part of that strategy, which turned out to be a role model for how to sell space-based weapons to the public. The MX missile is yet another weapon system that we didn’t need. I founded the Institute for Security and Cooperation in Outer Space, a Washington DC based think tank. I am an author and have testified before Congress and the President’s Commission on Space. The strategy that Wernher Von Braun taught me was that first the Russians are going to be considered to be the enemy. In fact, in 1974, they were the enemy, the identified enemy. We were told that they had "killer satellites". We were told that they were coming to get us and control us – that they were "Commies." Then terrorists would be identified, and that was soon to follow. We heard a lot about terrorism. Then we were going to identify third-world country "crazies." We now call them Nations of Concern. But he said that would be the third enemy against whom we would build space-based weapons. And the funniest one of all was what he called aliens, extraterrestrials. That would be the final scare. And over and over and over during the four years that I knew him and was giving speeches for him, he would bring up that last card. "And remember Carol, the last card is the alien card. We are going to have to build space-based weapons against aliens and all of it is a lie." I think I was too naïve at that time to know the seriousness of the nature of the spin that was being put on the system. And now, the pieces are starting to fall into place. We are building a space-based weapons system on a premise that is a lie, a spin. Wernher Von Braun was trying to hint that to me back in the early 70’s and right up until the moment when he died in 1977. What he told me was that there is an accelerated effort in place. He didn’t mention a timeline but he said that it was going to be speeding up faster than anybody could possibly imagine. That the effort to put weapons into space was not only based on a lie but would accelerate past the point of people even understanding it until it was already up there and too late. When Von Braun was dying in front of me, the very first day that I met him, he had tubes draining out of his side. He was tapping on the desk telling me, "You will come to Fairchild." I was a schoolteacher. He said, "You will come to Fairchild and you will be responsible for keeping weapons out of space." The way he said it with this intenseness in his eyes, and added that very first day, the first time I met him, that space-based weapons were a dangerous, destabilizing, too costly, unnecessary, untestable, unworkable idea. The last card that was being held was the extraterrestrial enemy card. The intensity with which he said that, made me realize that he knew something that he was too afraid to mention. He was too afraid to talk about it. He would not tell me the details. I am not sure that I would have absorbed them if he had told me the details or even believed him in 1974. But there was no question that that man knew and had a need to know, I found out later. There is no doubt in my mind that Wernher Von Braun knew about the extraterrestrial issue. He explained to me the reasons why weapons were going to be put into space, the enemies against whom we were going to build these weapons, and that all of that was a lie. He mentioned that extraterrestrials were going to be identified as the final enemy against whom we were going to build space-based weapons back in 1974. The way he said it to me, there was no doubt in my mind that he knew something that he was too afraid to talk about. Wernher Von Braun never spoke to me about any of the details that he knew related to extraterrestrials except that one day extraterrestrials were going to be identified as an enemy against whom we are going to build an enormous space-based weapons system. Wernher Von Braun actually told me that the spin was a lie – that the premise for space-based weaponry, the reasons that were going to be given, the enemies that we were going to identify – were all based on a lie. I have been tracking the space-based weapons issue for about 26 years. I have debated Generals and Congressional Representatives. I have testified before the Congress and the Senate. I have met with people in over 100 countries. But I have not been able to identify who the people are who are making this space-based weapons system happen. I see the news. I see the administrative decisions being made. I know that they are all based on lies and greed. But I have yet to be able to identify who the people are. That is after tracking this issue for 26 years. I know that there are big secrets being kept and I know that it is time the public and decision-makers pay attention to the people who are now going to be disclosing the truth. Then we need to make some definite changes and build a system in space that will benefit every single person, and all of the animals, and the environment of this planet. The technology is there. The solutions to Earth’s urgent and long-term potential problems are there. I have a feeling that once we start studying this extraterrestrial issue, all of the questions are going to be answered that I have had for 26 years. But I have concluded that it is based on a few people making a lot of money and gaining power. It is about ego. It is not about our essence and who we really are on this planet and loving each other and being at peace and cooperating. It isn’t about using technology to solve problems and heal people in the planet. It isn’t about that. It is about a few people who really are playing an old, dangerous, costly game for their own pocketbooks and power struggle. That is all it is. I believe that this entire space-based weapons game is initiated right here in the United States of America. What I hope is that with this information that is being disclosed, the new administration will to do what is right. That is to transform the war game into a space game so that we use the technologies that are available not just as spin-offs of war technology, but as direct technological applications to build a cooperative space system that will benefit the entire world and that will allow us to communicate with the extraterrestrial cultures that are obviously out there. Who would benefit from these space-based weapons? They are the people who work in that arena, people in the military, in industries, in universities and labs, in the intelligence community. This is not just in the United States but it is worldwide. This is a worldwide cooperative system. Wars are cooperative. Just as peace will be when it breaks out. But right now there are a lot of people benefiting. This is what our economy has been based on in this country and spreading around the world- war. People suffer as a result. It is not fair. It never has been. People have screamed: "out of swords let us build plow shares, let’s have peace and hold hands around the world," but it hasn’t worked because too many people are benefiting. Not only are they benefiting financially, but from what my experience is there are people who actually believe that Armageddon should happen so we have to have these wars. So it is going from the pocketbook, to the religious right: some people actually believe that we have to have wars for these religious reasons. There are people who just love war. I have met warriors who just love to go to war. Then there are the good people, the soldiers, who just take orders. They have to feed their children and send them to college so they want to keep their jobs. People in laboratories have told me that they don’t want to work on these technologies for war but if they don’t they won’t get a paycheck. Who is going to pay them? But what I see is that there are not only dual uses for these technologies but there are many uses for the same technologies. We can build space hospitals, schools, hotels, laboratories, farms, industries. It may sound far out but if we don’t do that we are going to build battle stations and weapons pointed down all of our throats and into space. Apparently we have been doing some of that already. We have a choice now that can be made. We can all benefit – all of the people in the military industrial complex, in the intelligence community, in universities and labs, in the United States and all over the world – we can all benefit. We can just transform that industry so easily with just a decision based on our highest consciousness, our spirituality, and on the fact that we have no choice unless we all want to die. And we don’t. So we can all benefit financially, spiritually, socially, psychologically; it is technologically and politically feasible to transform this game now and everybody will benefit. In 1977 I was at a meeting in Fairchild Industries in a conference room called the War Room. In that room were a lot of charts on the walls with enemies, identified enemies. There were other more obscure names, names like Saddam Hussein and Khadafi. But we were talking then about terrorists, the potential terrorists. No one had ever talked about this before but this was the next stage after the Russians against whom we were going to build these space-based weapons. I stood up in this meeting and I said, "Excuse me, why are we talking about these potential enemies against whom we are going to build space-based weapons if, in fact, we know that they are not the enemy at this time?" Well, they continued the conversation about how they were going to antagonize these enemies and that at some point, there was going to be a war in the Gulf, a Gulf War. Now this is 1977, 1977! And they were talking about creating a war in the Gulf Region when there was 25 billion dollars in the space-based weapons program that had yet to be identified. It wasn’t called the Strategic Defense Initiative, at least. Not until 1983. This weapons system, then, had obviously been going on for some time and I didn’t know anything about. So I stood up in this meeting in 1977 and said, "I would like to know why we are talking about space-based weapons against these enemies. I would like to know more about this. Would someone please tell me what this is about?" Nobody answered. They just went on with this meeting as though I hadn’t said anything. Suddenly I stood up in the room and said, "If nobody can tell me why you are planning a war in the Gulf when there is a certain amount of money in a budget so that you can create the next set of weapons systems that will be the beginning of the sell to the public about why we need space-based weapons, then consider this: my resignation. And you will not hear from me again!" And nobody said a word, because they were planning a war in the Gulf and it happened exactly as they planned it, on time. SG: Who was at this meeting? CR: The room was filled with people in the revolving door game. There were people that I had seen once in a military uniform and other times in a gray suit and an industry outfit. These people play a revolving door game. They work as consultants, industry people, and/or military and intelligence people. They work in the industries and they revolve themselves through these doors and right into government positions. I stood up in this meeting and asked if I was hearing correctly. That when there was 25 billion dollars expended in the space-based weapons budget, that there was going to be a war in the Gulf, stimulated, created, so that they could then sell the next phase of weapons to the public and the decision-makers. This war was going to be created so that they could dump the old weapons and create a whole new set of weapons. So I had to resign from that position. I could no longer work in that industry. In about 1990 I was sitting in my living room looking at the money that had been spent on space-based weapons research and development programs and I realized that it had come to that number, about 25 billion dollars, and I said to my husband, "I am now going to stop everything. I am now going to stop and sit and watch CNN television and I am going to wait for the war to happen." My husband said, "Well, you have finally gone over the edge. You have flipped out." Friends said, "You have really gone too far this time. There is not going to be a war in the Gulf, nobody is talking about a war in the Gulf." I said, "There is going to be a war in the Gulf. I am going to sit here and wait for the war in the Gulf." And it happened right on schedule. As part of the war game in the Gulf, we in the public were told that the United States was successful in shooting down Russian Scud Missiles. We were rationalizing new budgets based on that success. In fact, we found out later, after the budgets were approved for the next phase of weapons, that it was a lie. We did not have successful shoot-downs the way we were told. It was all a lie, just to get more money put in the budget to make more weapons. I was one of the first people to go independently to Russia when I heard that they had "killer satellites." When I went to Russia in the early 70’s, I found out that they didn’t have killer satellites, that it was a lie. In fact, the Russian leaders and people wanted peace. They wanted to cooperate with the United States and with the people of the world. Another time I called Saddam Hussein when he was lighting his oil fields on fire. My husband was in the kitchen while I was making this phone call. I got a call back from his First Attaché with Saddam Hussein nearby and he asked, "Are you a reporter? Are you an agent? Why do you want to know?" I said, "No. I am just a citizen who helped to start the movement to prevent the weaponization of outer space and I have found that a lot of stories that I have been told about weapons systems and the enemies are not true. I wanted to find out what would satisfy Saddam Hussein so he would stop making these oil fields catch fire and stop antagonizing people." He said, "Well, nobody has ever asked him that question, what he wants." So when I hear that there is a possible threat of extraterrestrials – and I look at the history of thousands of years of possible ET visitations, and hear the disclosures of honest military-intelligence-industry people who have had experiences with UFO’s, with crashes and landings, with live and dead bodies of extraterrestrial beings – I know it is a lie. And if I am ever told that these are enemies against whom we have to build space-based weapons systems, based on my own personal experience of having worked in the military industrial complex on weapons systems and military strategy, I am going to know it is a lie. It is a lie. Not only will I not believe it, but I am going to go out as loudly as I can and tell everyone to take a look. They [the ET’s] have not taken us away yet. We are still here after thousands of years of visits. If in fact they are still visiting us now and we have not been harmed then we have to look at this as something that is not a hostile occurrence. It would be my hope and my intention to do everything I could to work with people who are working to communicate with and cooperate with these extraterrestrial beings. They are clearly not hostile. We are here. That is enough proof for me. There is no limit to how people can choose to live on this planet. We have a chance to do that and I think that the window is closing rapidly. I don’t think that we have much time in which to make that decision. We are too close in too many ways to having some horrible disaster happen, having some sort of war take place, whether it is from high technology or an exotic weapons system. We need leadership and it has to start with the United States President and that is who we all have to reach. If you are international, if you are around the world, if you are in the United States of America, whether you are from any party, any belief system or religion- the United States Commander in Chief, the President of the United States is the person that needs to be reached. We need to say that we want an ultimate, comprehensive, verifiable ban on all space-based weapons.